As you can tell, I have more than a few things to share with the world today. So, let’s get right down to it. We’re less than 1 month away from the release of my novella, The Waiting. It just got a new 4 star review from Night Owl Reviews. “The Waiting has a great plot, with an ending that will blow you away!” I’d buy that for a dollar. OK, I had to in light of that terrible Robo Cop remake. 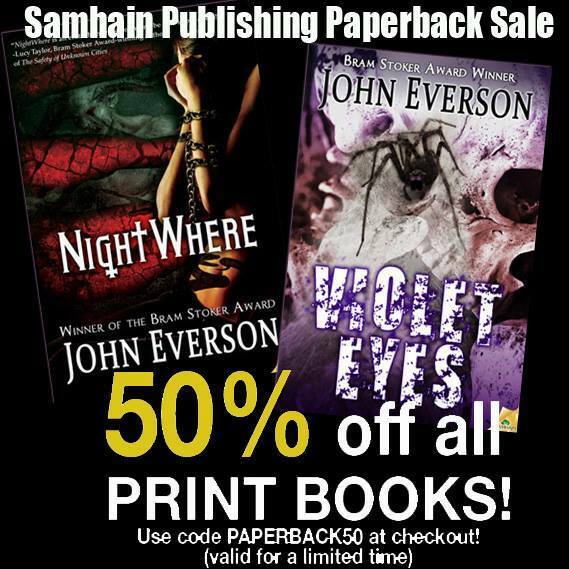 My publisher, Samhain, is running a fantastic special right now on their trade paperbacks. If you order with the code listed below, you get 50% off any print title. You can’t beat that with a chainsaw. Get it now while you can and stock up on your summer reading. I recently posted my favorite horror movies of 2013. The Monster Men decided to expand on it and make it an episode – our longest to date but I know you’ll get a kick out of it. Plus, I’m sure we’ll give you a few flicks to add to your wish list. As a perfect contrast to the Monster Men, the guys at Splatter Chatter dished on their all time WORST movies. Really funny, and at times, scarily passionate. You have to check them out. And last but not least, I’ll be appearing at Horrorhound Weekend in Cinicnnati in 3 weeks. The Samhain table is going to be at the entrance of the main exhibit hall. Come on down and have a beer withe me! Much more to come on this over the next few weeks, so stay tuned.